Celebrate Earth Day by Becoming a Clover Enthusiast! This Earth Day, please join us in celebrating, propagating, and educating about a misunderstood and beneficial plant: clover. “White clover used to be a standard ingredient in every grass seed mix; 75 years ago no one planted a lawn without mixing a little white clover in with the grass seed,” recounts Roger Swain, host of PBS’ The Victory Garden. After World War II, as the middle class grew and moved to suburban communities, chemicals developed during wartime found new uses on U.S. lawns. Chief among them was 2,4-D – an herbicide originally developed with the intent to wipe out potatoes in Germany and rice crops in Japan in a plan to starve the Axis powers into surrender. While 2,4-D was never used for that purpose, its ability to kill broadleaf plants while sparing grass species made it desirable on the farm for removing weeds around crops like wheat, corn, and rice. Chemical companies hoped these same characteristics would win over American homeowners, who would simply need one blanket application to rid their lawn of weeds. In 1945, the American Chemical Paint Company released the first residential use 2,4-D herbicide, Weedone, and later in the decade, Scotts packaged its first ‘weed and feed’ product. Some say that it was not until the 1966 Masters golf tournament’s bright green turf was broadcast on color television that the idea of a monoculture lawn really took hold. Despite clover’s role in the rise of the American lawn, its susceptibility to broadleaf herbicides, like 2,4-D, put it at loggerheads with the new technology, and through aggressive marketing and advertisements, by the 1950s it began to be regarded as a weed. Clover is a wonderful plant. Clover is a low-growing, drought-tolerant perennial. There are nearly 250 species of clover in the world. Though red, crimson, and white are the most familiar, it is white, or Dutch, clover that is best suited to be incorporated into turfgrass and lawns. A variety of low growing white clover called microclover can provide all the benefits of clover, while producing fewer flowers and remaining somewhat hidden below the grass. Bringing clover back into American lawns is predominately a cultural issue. It requires a change in perception about what constitutes an aesthetically pleasing landscape, and education about the ecological benefits and cost-savings that clover can provide. Individuals can press their local government to incorporate grass-clover seed mixes into their public parks and green spaces and inform neighbors of the benefits of doing so. Clover is great for soil. Contrary to the perception that clover is an eyesore, it helps the lawn remain verdant green during the growing season. As a member of the legume family, clover “fixes” (accumulates) nitrogen from the air through beneficial soil bacteria living in nodules on its roots. Clippings left on a lawn after a mixed grass-clover turf is mowed can provide a significant source of cost-free nitrogen. For many soils and grass types, this is enough to eliminate the need for any additional nitrogen fertilizer applications over the course of the year. Planting clover in your lawn is a small and easy way to help bolster pollinator populations. Recent research finds that clover acts as a food source for a wide range of important pollinator species. A 2014 study published by Larson et al. in the Journal of Insect Conservation on species richness in mixed grass-clover lawns in the Lexington, KY metro area documented over 200 pollinator species over the course of spring sampling, including approximately 21 different species of bees. On average, each lawn contained between 2-12 different pollinator species. City-dwellers tending a small patch of lawn certainly are not doing so in vain, as researchers found species richness to be similar in urban, suburban, and periurban-rural areas. The beauty of reviving clover on the American lawn is that every individual with a patch of green space can make a stand. Let the clover already present flower, and don’t be afraid of seeding more. Yes, your lawn will contain small white flowers, and yes, you’ll attract bees to your yard, but you know that’s a good thing for your wallet and the environment, and when your neighbor asks what you’re doing, you’ll be ready to respond. As you celebrate clover, you can also make the case for restrictions on the use of synthetic herbicides that treat clover as a weed and insecticides that undermine the services the plant provides. Learn more about organic lawn care, and check out our “Tools for Change” page for more info and resources regarding organizing in your community. Dutch White clover is the traditional option to add to turf grass, but you can also have poppies and clover (see picture below) as a cover crop. Many garden centers and hardware stores now carry clover seed, and it can also be purchased online (Here or here, or check out our pollinator-friendly seed list). DFL organics and EarthTurf are two companies which specialize in grass-microclover seed mixes. Source: Taking a Stand on Clover by Drew Toher. Brand New Sign and Website! Hello there friends and fans! After much work and sleepless nights (and realizing that my being “semi-retired” is not quite working the way I had imagined) the new website is now live and taking orders! 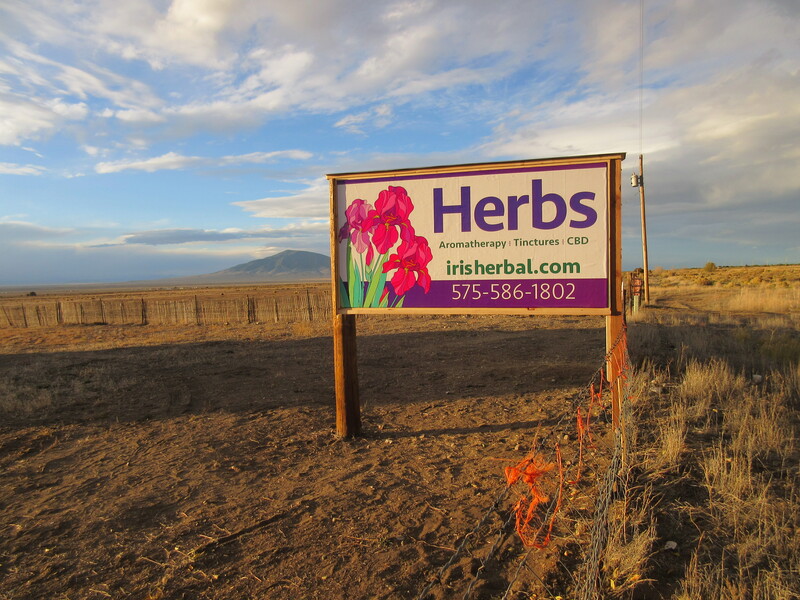 Come check out the revamped Iris Herbal here! I also have a brand new store sign! If you are heading up and down HWY 22, feel free to honk & wave!